Letter writing is an exercise in futility, an old-fashioned, almost forgotten method of communication which no one, in our highly technological and instant communication world, partakes of. That is, unless they are a child thanking a grandparent for their quickly discarded birthday presents, or a company demanding payment for some unpaid service from a negligent customer. For anyone who believes that the ancient art of letter writing, of communication between two people is dead and buried I have a revelation: letter writing is alive and well, just not as visible as communication on a mobile device. Those remaining few who insist on communicating by writing words in ink, on paper, simply do not do it in full view of the general public, and certainly not while attempting to walk down an open street, unaware of everyone else in the world outside their small, hand-held device, and creating a danger to themselves and other equally distracted pedestrians or drivers. It was possibly this modern form of distraction which changed my way of life in November 2016 and, as a happy result, brought me back to the joys of the written word. The person distracted was not, however, meandering down a relatively safe pavement, but driving an automobile which, being devoid of any form of artificial intelligence to warn of wrongdoing, drove straight, and with considerable speed, into the vehicle I was operating. After several weeks of medical containment, during which time I had the pleasure of meeting several members of that esteemed profession determined both to allow my crushed foot to heal and my heart to return to something akin to a normal function, I had read all the books which had been awaiting my attention, visited all the shops in the immediate area and beyond, and the museums, and the art galleries, and the coffee shops, and surfed through the entire Internet twice. If this old-fashioned pastime of letter writing is a thing of the past, and no one in our modern age finds any interest in reviving it, why are there so many thousands of people registered with the many Internet web sites dedicated to snail mail and such outmoded forms of communication as letter writing and sending postcards? Why are so many of these web sites being continually updated with new names, profiles, hopes and wishes? Having begun this web site with an idea, and then left it through pressure of work, I returned and wrote my first letter to a completely unknown person on 20 January 2017, having spent about ten days sifting and sorting, trying to decide what I was looking for and what, if anything, I hoped to gain by communicating with a stranger. I also weighed up in my mind something which, in real life, is a very present consideration in all relationships: our ages. It was clear to me that any liaison would be purely platonic and I was certainly searching for nothing more than an exchange of letters, regardless of the depth and breadth of their content. My final decision rested upon a young woman who had first been incarcerated at the age of eighteen, and would not enjoy the pleasures of freedom for many years; a young woman who would miss her entire life on every single imaginable level by being involved in an incident which she, perhaps, could hardly have avoided let alone stopped. It was also clear to me, as an old man, that writing to a younger woman would not necessarily elicit any response whatsoever, but I was writing as a therapy for myself, as much as entering into conversation with someone else. One week later I wrote to her again, having discovered that the spark of interest within my own breast had increased to a flame, almost a passion to communicate, whether there was a reply or not, whether the first letter I had written could have been delivered in such a short space of time or not. With over nine thousand profiles on one pen friend site I had chosen, this new found passion for letter writing did not have to limit itself to any one person. From 27 January through to 4 March 2017 I wrote one letter each day. I received my first reply to a letter on 10 March, another on 21 March, then two more on 24 and 25 March 2017. Two females, two males; whereby I should say, someone told me they would never write to another male because it was gay, and I disagreed with them quite vehemently since the act of writing a letter is not automatically an invitation to the sexual act, and letter writing is about communication and conversation regardless of gender. Do you think anyone – two thousand years from now – would find our conversations of interest should our letters be preserved? I should assume not lest I feel the urge to edit myself for the sake of historical relevance. Do you think that Cicero and Pliny, two thousand years ago, imagined that their letters would be preserved and be of interest to coming generations? Cicero certainly not: he hoped that his other written works would be preserved and had them published for the greater good. Pliny the Younger, on the other hand, was very much into the idea of immortality through publication, through having his name not only on works he had penned, but also within the histories of others. Neither one of them would have been able to imagine how their works would be read in the future, of that I am sure. But our letters? Perhaps, in two thousand years, people will want to look back and see how the last stubborn dinosaurs of a changing, technological world managed to survive despite the advance of other means of communication, despite artificial intelligence, virtual reality and the ability to order pizza online. They will marvel that humans actually took compressed wood pulp and cotton waste in their hands and managed to decipher markings pressed into the surface, let alone created such things. And somewhere, perhaps on the Steppes far away from civilisation, a small, select group of people will recite the books they have learned by heart and are keeping alive for the benefit of future mankind. I think, if I was going to put my collected letters together and make something for the future, I would choose those letters I have written which have never received a reply. and is a sentiment I can well understand, and almost call my own. 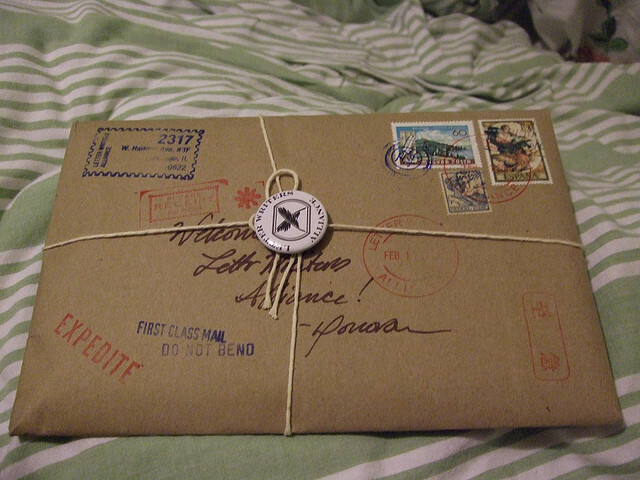 That said, the pleasure of receiving one letter, such as yours, far outweighs the time and effort expended on writing to other people who did not feel the need, or perhaps were too overwhelmed, to reply. Admittedly, many of the letters I have written this year have been to institutions rather than individuals – and I include politicians in this institutional sum – so there is not an individual person I could turn to and point an accusatory finger at, but even so, the number of letters taken over the number of replies (double figures over single figures) would make anyone else wonder whether the time and effort, even the cost of postage, had been worth dedicating to the art. Personally, admitting that I am very biased in such matters, I think it has been. If you don’t use a skill you have, it rusts. Many people today would be incapable of writing even a thank-you note to Grandma for the unwanted Easter pullover received last December, let alone stringing together several pages packed with news and intrigue which entice the reader to plunge further in, or reply. And then, as I mentioned, having just the one good reply makes all the other failings drift off into the darkness of a forgotten realm where, I sincerely hope, they will rot in peace, alone. No, I’m not a bitter person; cynical perhaps, but not bitter. I enjoy writing, and that is my journey. Perhaps I can also be happy in the thought that, even if many people do not reply, at least I have been able to give them a moment away from their normal routine, something which they had not expected. Possibly, I must admit, also something they did not particularly want – I mean, how many people are going to feel comfortable reading a letter written in the style of an eighteenth century man? – but that is a decision each must make for themselves. Although, it is somewhat strange when a person you’ve written to takes the trouble to read your letter, then pack it in a brand new envelope, stick a few stamps on the outside and address it, and send it back again. No comment, not annotation, no reason. Humans are strange animals. And humans are strange in their ability to make friends without the need to have shows of force or superiority, which is one of the things that I enjoy about letter writing: we can communicate; we can say all that we wish to say, all that is in our minds at any given moment in time, and be certain that the person we are writing to will not interrupt. You might find this a strange thought, but you have no idea how many times I have been involved in a serious conversation, a debate or been giving a talk, and there is an interruption which brings me – or anyone else in the same position – right off course so that it is almost impossible to recapture the moment, go back to the thread which was being followed or recreate the images which had been there for everyone else before. Letter writing is as much about ego, when you look at it this way, as anything else: all about me. In fact it isn’t, of course, it is all about the ability to communicate completely, and a good writer, which I hope one day to become, does not simply write about themselves, but incorporates much more of real interest and real value on the page. This is probably why writers such as Cicero or Pliny, Dickenson and Walpole are of such great interest so long after they have gone: what they have left behind is still alive, still speaks to us after all these years, and that despite the fact that we cannot put ourselves completely into their times, into their world. So perhaps our letters will be of interest to those, in a few thousand years, who stumble across the sheets of paper lovingly preserved in a shoebox and tied together with fading ribbons. My only hope is that any letters found are not dug out of the ruins of a town such as Pompeii: that is not my idea of eternal preservation or immortality! What will the readers of the future think, coming across our words? Will they know who Carlos Fuentes is / was, or even Pliny the Younger? Come to that, aside from we two, does anyone else living today know who they are? There are only a select few who can tell us who Michael de Montaigne was, when and where he lived, why we remember him; but at least they are not living in a small group on some isolated Steppe, memorising texts, to keep them alive for the future which is some small consolation. And perhaps he would have earned himself a certain literary immortality, had he not already been granted it by reporting on the eruption of Vesuvius and the destruction of Pompeii in 79 CE, and even without these additional letters. The idea put forward, in a manner of speaking, by Karen did grow on me but, as I wrote to her at the time, only a small selection of those letters which bore no fruit, those exercises in futility, would be included if I did publish. This site, however, is a different matter entirely. John Phocas: A general description of the settlements and places belonging to Syria and Phoenicia on the way from Antioch to Jerusalem, and of the holy places of Palestine edited by John Wilkinson with Joyce Hill and W. F. Ryan and published in Jerusalem Pilgrimage 1099 – 1185 by The Hakluyt Society, London, 1988. Emily Dickinson, from The Poems of Emily Dickinson edited by R. W Franklin, published by The Belknap Press of Harvard University Press, Cambridge and London, 1999. Pliny the Younger (Gaius Plinius Luci filius Caecilius Secundus), from Pliny: Letters and Panegyricus translated by Betty Radice, published by the Loeb Classical Library, Harvard University Press, 1969.